Chevrolet's European SUV line-up is about to expand, with the new Trax joining the Captiva to take on the raft of compact crossovers making their debuts in 2013. The Vauxhall Mokka-based Trax will no doubt also have the all-conquering Nissan Juke in its sights. 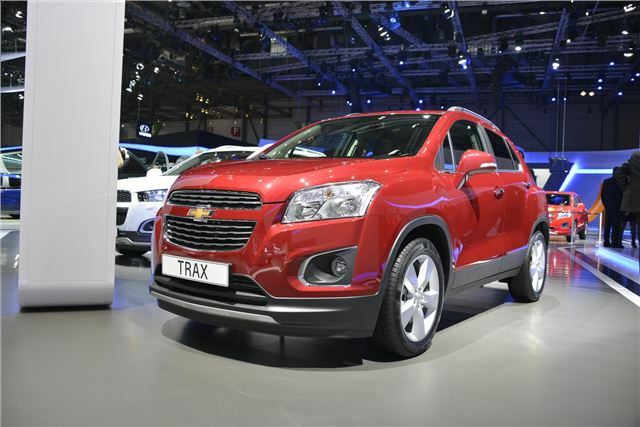 The new Trax features bold styling, and is scheduled to hit the UK dealer network this spring. It will be powered by a range of engines made up of the 138bhp 1.4-litre turbocharged petrol engine, a 114bhp 1.6-litre petrol unit as well as a 130bhp 1.7-litre turbodiesel engine. All manual transmission variants come with stop-start technology. UK cars will be available in LS and LT-spec, and flagship cars will have electric and heated memory seats. A host of driver assistance technology is available, including stability control, Hill Start Assist and a reversing camera. There’s even hill-descent control for those urbanites who fancy a bit of weekend outdoor recreation. Starting price for the Trax is £15,495 and for that price, you get 16-inch alloy wheels, air conditioning, rear parking sensors, automatic headlamps, cruise control, Bluetooth, remote central locking, and CD/Radio with MP3, USB and AUX in.